If you have an upcoming celebration and are hoping to visit a party store soon to buy balloons, you may feel a little deflated to learn some are out of helium. 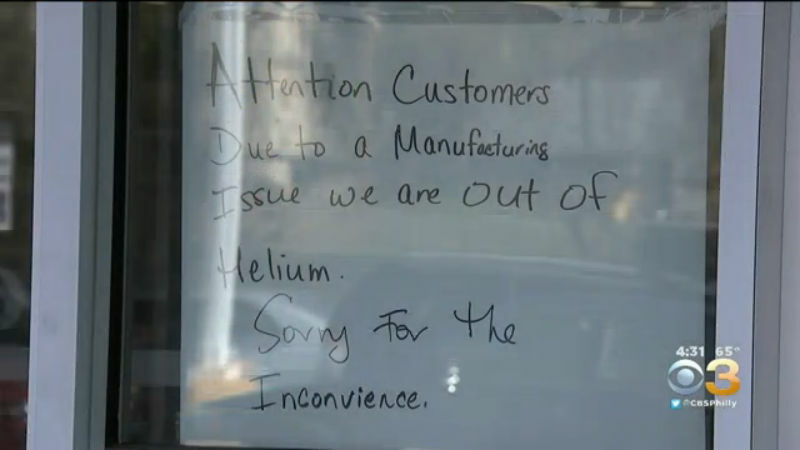 A worldwide helium shortage is forcing businesses to explain to customers why the gas is not available. The reason why there is a shortage is long and complicated. The short answer is helium cannot be manufactured and the global supply is down. The helium shortage is really impacting mom and pop party stores.David Cattai, of Dino’s Party Center on 9th Street in South Philadelphia, has been running the store for almost four decades, but he says a helium shortage is sucking a lot of the air and money out of his store. “What’s happening is the supply, locally, isn’t there,” said Cattai. The shortage is causing the price of helium tanks to skyrocket, and that has inflated what he charges customers. Filling one helium balloon at Dino’s Party Center now stands at $2, so some people are turning away from them. “The cost has gone up so people are trying to say, ‘Hey, I’m not gonna spend that money on balloons. It’s just balloons,’” said Cattai. Cattai’s store isn’t the only one impacted in the Philadelphia area. The Dollar Tree on City Line Avenue had a sign that said the store is out of helium. Many stores are hoping the helium shortage ends but that’s not happening any time soon. This entry was posted in Helium shortage. Bookmark the permalink.